The "chicky" plates are sticking around for another appearance on The Little Round Table. Just too cute to put away so soon. 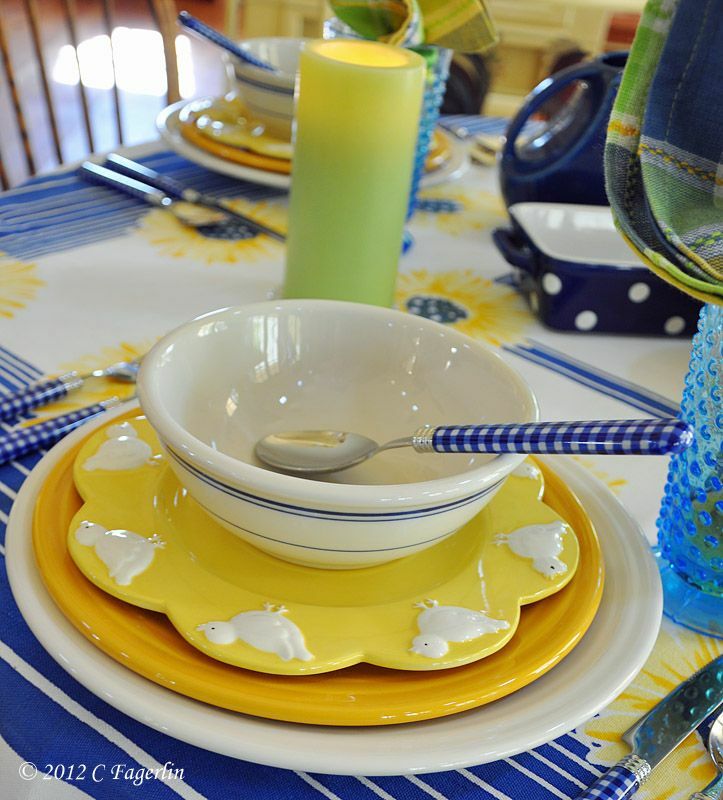 Contemporary Fiesta in White, Sapphire and Marigold. 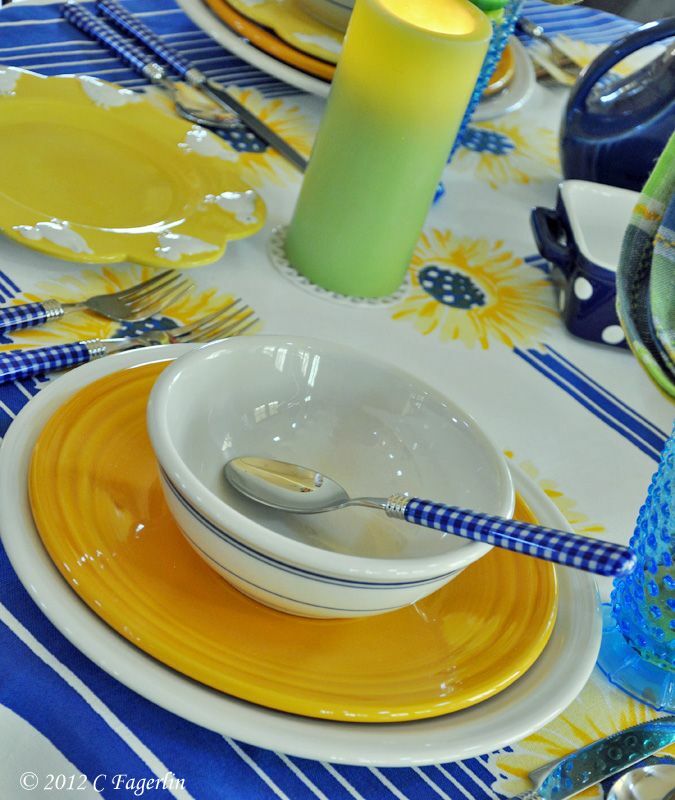 Blue Striped bowls from Homer Laughlin's Diner line. "LOVE IT, LOVE IT"! Again I ALWAYS envy you for having SO MANY wonderful colors to work with. 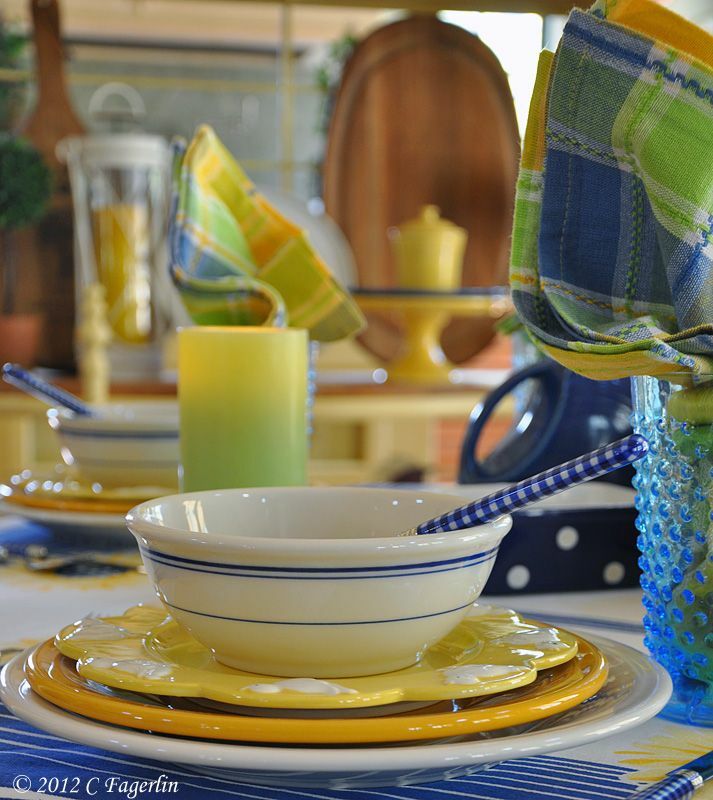 Again, as I set my table I think of you having the COLOR I NEED for my perfect setting. I LOVE Sapphire, I was born in September SO you can say it's one of my VERY FAVORITE colors! and with YELLOW, "It's a winner"! My VERY VERY Favorite thing you did here is PULL THAT Bakers rack up as a divide. 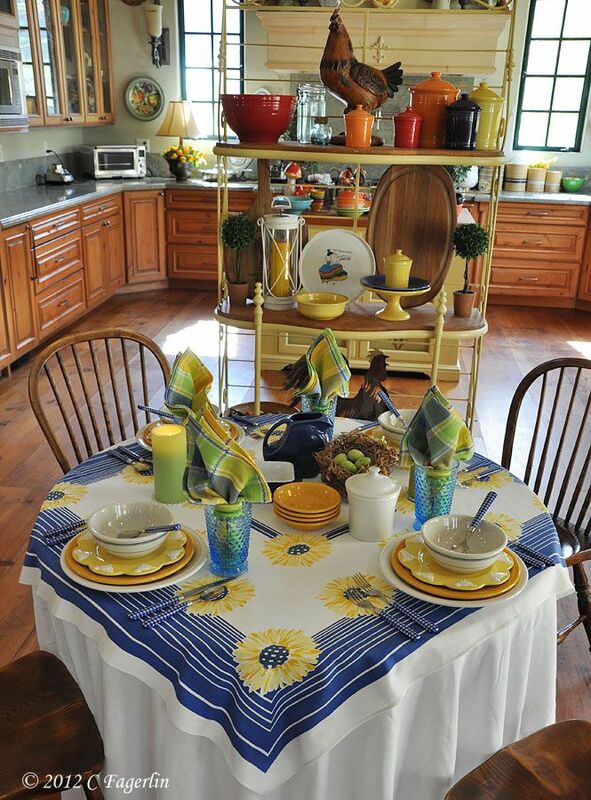 It gives your table a COZY feel in such a large room! I'm going to steal that idea away from you! What a grande idea when you need more SPACE for all the goodies you are serving too. Thank you SO MUCH for sharing your beautiful setting. Beautiful! 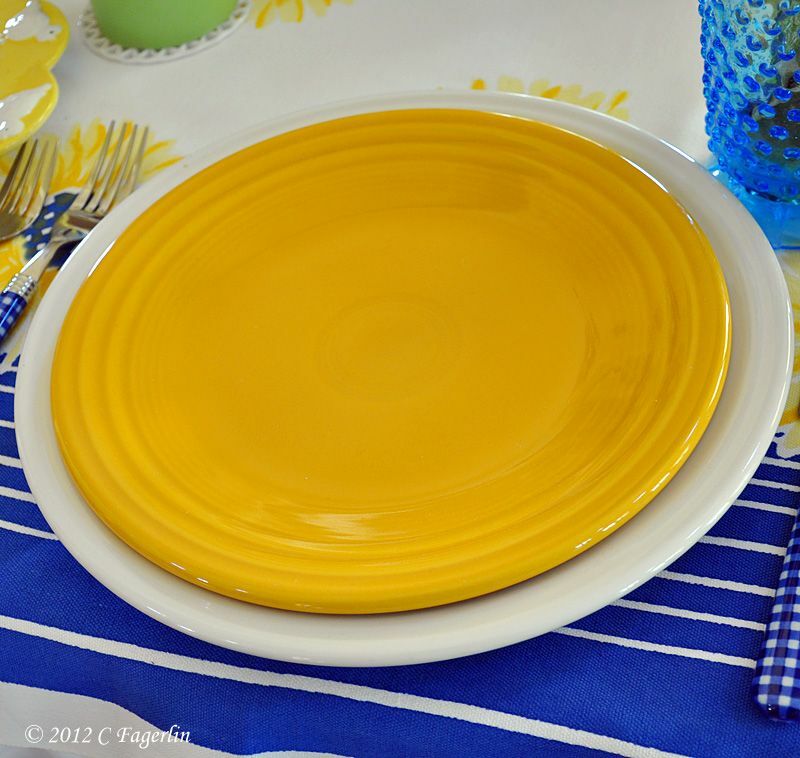 I love the bright bold colors and those chicky plates are just the cutest ever. This table just makes me feel so happy! It makes my heart smile. 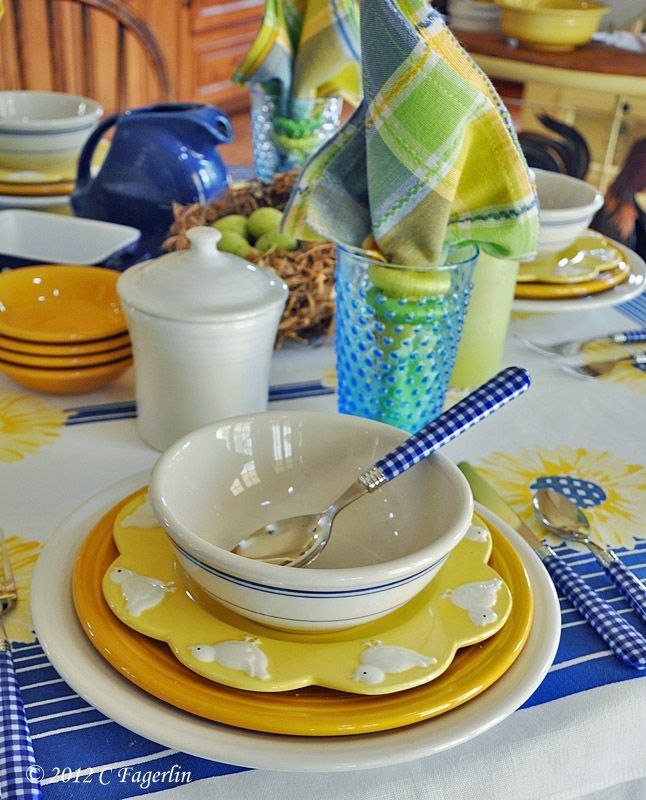 Love the bright colors and of course the chicky plates. 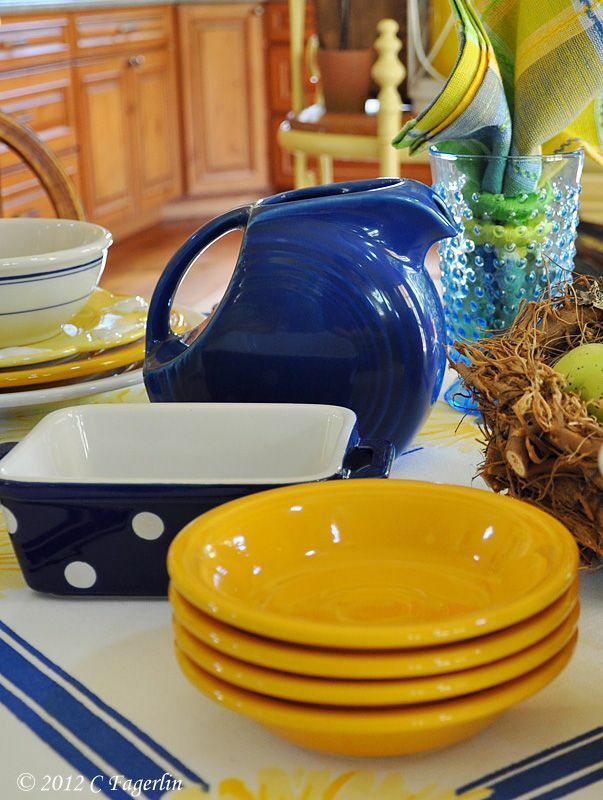 There is just something about yellow, blue and white! 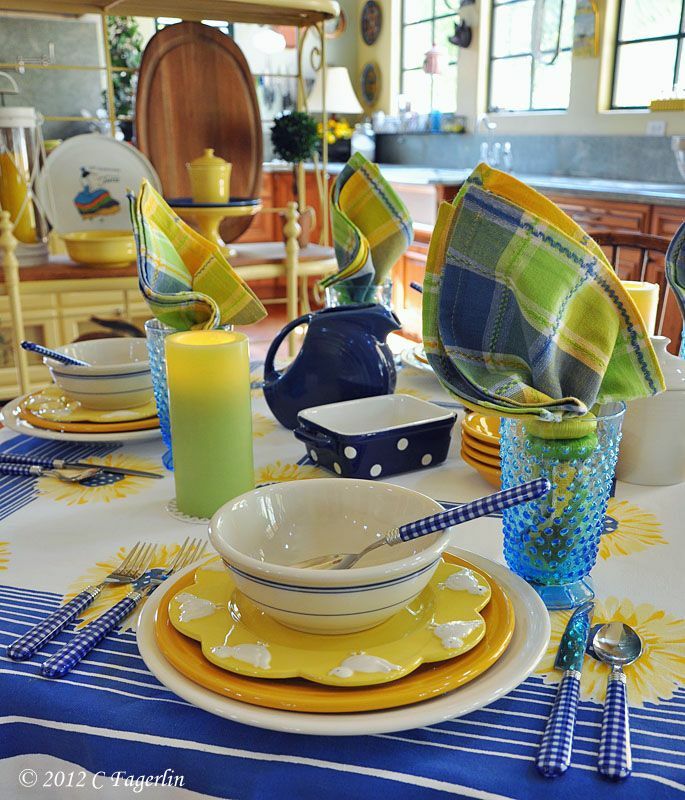 YOu set a very cheery table! 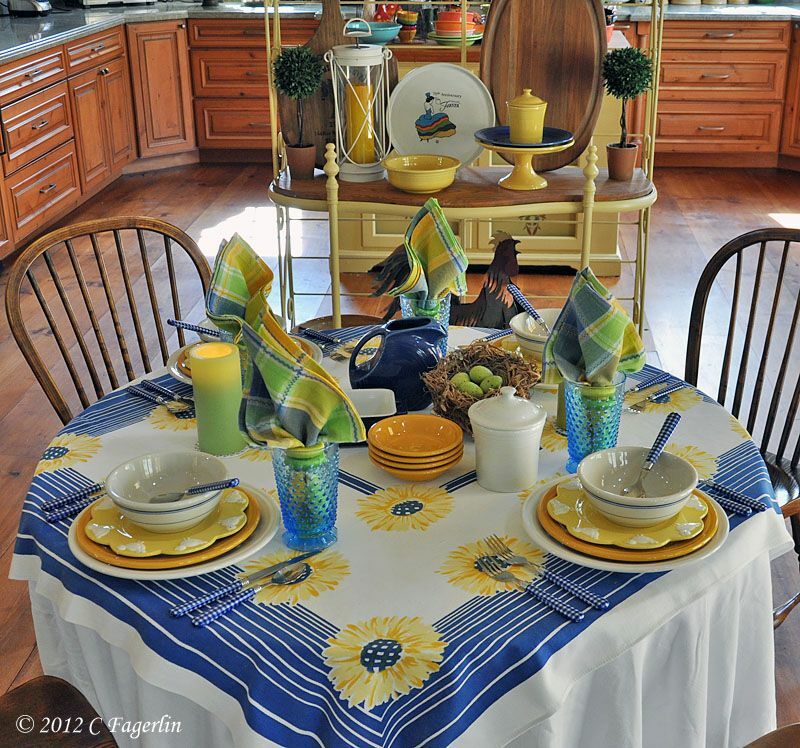 LOVE that tablecloth. It really carries out your happy theme. Very clever, Candy, how you put the napkins in the glasses with the napkin rings on them. Just delightful! Your blog is just charming and I'm now following you. I'd love to have you drop by. We both have a thing for tables and good food.(smile). Love it!!! 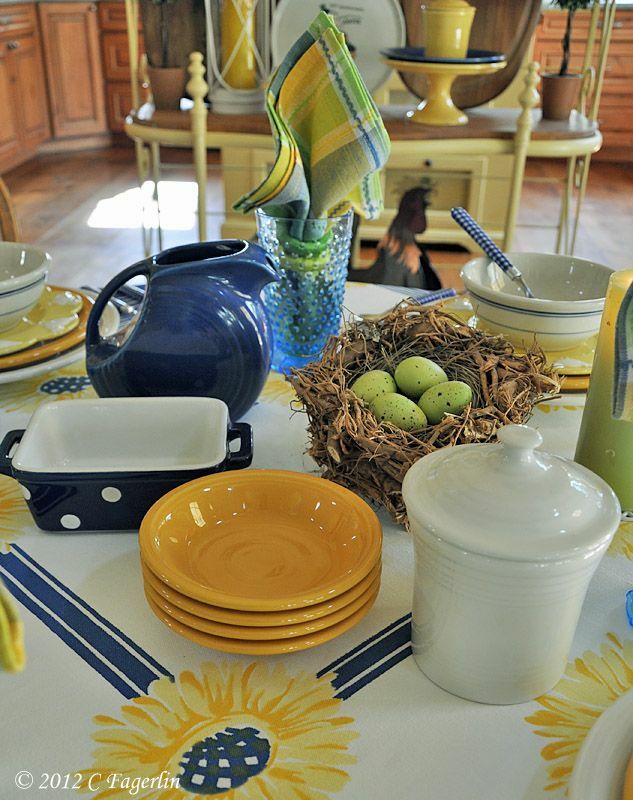 This is such a fabulous table, I can't say what is my favorite thing...too many to choose from! 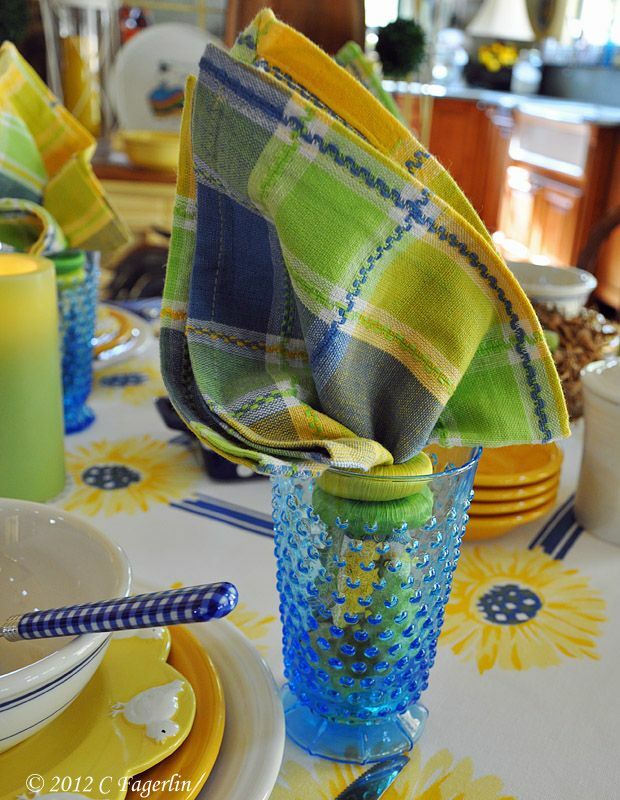 All these bright colors together make a handsome table! You've really thought about every detail! This is a very happy table.